The one time I tried it, the ZZ/RW combo tended the climbing line and slack very smoothly, similar to the Uni. I do have the utmost respect for the RW with a good hitch knot, but when choosing between devices, I lean more toward mechanical devices. Hitch cords are a lot more rope friendly than cam'd or teeth grabbing ascenders or multicenders, but tending a hitch knot is pain too. Still, it's always good to have options and backup systems. This Tachyon Ash I bought is bigger than 11.5. It is at least 1/2 inch in diameter and about the maximum diameter that slides through my ZZ. It also is not all that firm, but rather quite soft and pleasant to handle. No, I love the colours. One of the things that made me buy it. These rope size ratings, maybe they mean under a load? I just slipped a metric mike across the stuff and it is between 13 and 14 mm. But I guess it will tighten up and shrink in diameter a bit with weight on it. Anyway, I really like it both with the Bone and also RW/ZZ and hitches. Hey guys, there are plenty of threads to post in about your combinations of cordage and rope that work well together. I am also not interested in discussing the zig zag or any mechanicals. That's really beyond the scope of what I'm getting at. I can tie hitches that work great with fatter lines. The hitch isn''t the issue. In fact, weighted ascent and descent are both great with my setups, including the 13mm lines. The specific issue I'm attempting to address is larger lines not moving through the wrench itself in as smooth of a fashion. If you're moving through the canopy under your own power, and attempting to feed yourself slack, at some point you won't be able to get where you need to go unless you put your hand above the wrench and shove it down into your hitch. This is harder to do with fatter lines. And to add to the topic of lines seeming fatter then they are, many lines fatten up over time, especially ones that tend to milk. But back to what I was saying, imagine a different sized wrench that released easily on larger lines, one that would let you move unencumbered though a canopy when your weight isn't fully in it. I guess there's a reason why not more climbing gear isn't suited for the 13mm lines, except maybe when deciding on 10mm versus 8mm hitch cords. Rigging lines are built to endure greater loads, but for climbing needs, the 10mm-12mm size seems to fill the broadest spectrum when it comes to effectively getting the job done. I hear you though, better grips and fatter lines, aside from the added weight, are way more user friendly and easier to hold onto. Look no further. This wrench ought to easily slide over a 1/2" line. I understand the frustration of people taking your post in another direction than intended, talking about ropes and hitches instead of the wrench itself. However the wrench works in conjunction with the ropes and hitches and that is where you can fine tune it. In the above post you mentioned that your ascent and descent was smooth, if you modify your wrench it may alter that performance. 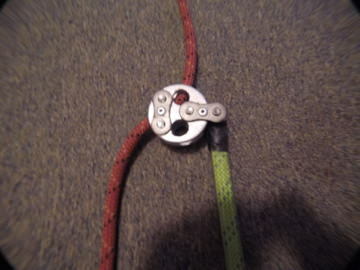 My suggestion would be that if your currently happy with your rope and hitch to try a mod on your wrench. Worse case scenario the modified wrench fails at height and your hitch is still there to catch you. If you do try tweaking it, make sure to share the results as someone else may benefit from it as well. I've heard of no news of something coming down the pipes to address this issue, but threads like this do identify a possible need, and might get the ball rolling in that direction. As to the 2nd paragraph of your quoted post, I do not, but maybe @Burrapeg could make up a second one of the type he made for himself, and sell it to you, but only with the blessings of @treebing, since he owns the rights to the Rope Wrench patent, I believe. Or maybe Kevin can suggest a newer, larger size be made by ISC. I'd be surprised if they'd do it, though, because of the likely small demand for it. My gut impression is that Kevin might not mind a guy making his own custom version of a Rope Wrench, but to have a third party make it for you and sell it to you would be crossing a line. I'd look hard at @Burrapeg's photo and try to make one of my own, if I were you. Anything else will take too long, or be illegal, in my humble opinion. what rope specifically are you trying to use? a 16 strand? the coarse nature of these ropes makes then drag a bit. I have had good luck running 13mm km3 as well as vortex. I like the fatter ropes for removals and smaller trees where I don't have lots of redirects. the wrench should accommodate 13mm with some adjustments to the hitch. you can get away with less twists and wraps with the thicker line and still have a reliable hitch.
. . . to have a third party make it for you and sell it to you would be crossing a line. I'd look hard at @Burrapeg's photo and try to make one of my own, if I were you. Anything else will take too long, or be illegal, in my humble opinion. . . I don't think I would want to make a custom RW for anyone else; there is a fine legal line between doing one for your own use and making one for another, when it involves a patented commercial product. Also there is the liability issue if it somehow failed for you. But really it is not a bad job to cobble them together yourself to experiment. Here is another I made (for smaller rope) that is mid-line attachable. Uses a quick release pin from MSC Supply Co. This took me less than two hours to make using only a woodworking bandsaw with a fine tooth blade, small drill press, and a file. In a pinch, it can be done with hand hacksaw and hand or cordless drill motor. Aluminium in various sizes is sold at many hardware stores. There are a number of possibilities for the bollards. Stacks of stainless washers the same size will let you adjust the width, and if you can find them in several diameters then you can adjust this too until you get it dialed in, whereupon you replace the washer stacks with bollards the same size. Contoured bollards make a real difference too. I made my wrenches to slide very easily, too easily in fact to engage reliably, so that is the reason for the short bungee to pull them up and ensure engagment. I have to keep an eye on these things when climbing on them in case the bungee broke, etc. but of course one needs to keep an eye on the situation anyway to tend a hitch, whatever. All this was solved for me when I saved up for one of Gordon's (Surveyor) Adjustable Bones. Get one of those and you can adjust it exactly for your own rope and weight, and the things work reliably and trouble free after that whether ascending, descending, limb walking, anything. You should make yourself a rope nut, just because it looks so magical while descending. @surveyor; Rope nut? What is that, and where and how does one use it? Thanks.